We have our grid for the one hour Main Final that will get underway in just under an hours time and determine who the new 2008 World Champion will be. The Semi A was the last run before the big race and a superb drive by Martin Christensen saw the Dane lead home a class act with double European Champion Dario Balestri, from whom he took the race lead during the final pit stop, taking second and double World Champion Adrien Bertin taking the last of the bump up placings. 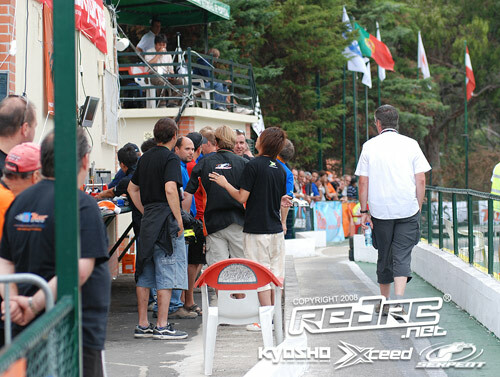 Starting from pole Balestri’s Novarossi powered Team Magic lead the way but the very fast Christensen chased him down. Entering the pits at 25 minutes, right on the tail of Balestri, a superb stop by the pitman of the Xray/Sirio driver allowed him to get passed the Italian where he would stay until the end. Bertin, who only came up the order late in the race, was pushed hard to the end by Josh Cyrul but the America ran out of time finishing just under 4 seconds behind the Frenchman. The race which was delayed twice, firstly after quick Aussie Peter Jovanovic called 10-minutes and then again when Walter Salemi had radio problems. Both got to start the race but unfortunately neither were to finish, Jovanovic lost steering due to fuel in his electrics while Salemi broke his Mugen early on. Fast German Robert Pietsch was holding a bump up position but retired just after the half way distant. Once again US Xray driver Ralph Burch was the fastest man on the track but he flamed just before his 2nd stop, ending all chances for him to bump up. The main final is due to get underway at 18:10 GMT with driver presentations and 15 minutes after the race will begin. 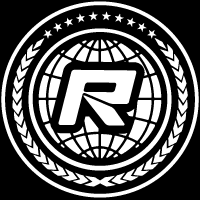 We will be bringing you live updates throughout the race on Red RC. Update: There is currently a protest underway regarding the results of Semi Final B so until that is resolved we cant bring you the main final starting order. Teemu Leino, Roland Strom and Paul Lemieux have secured their places in the 2008 Worlds Final after taking the top 3 places in the Semi Final B combined results. The race had to be run over two parts after a rain shower interrupted to orginal run 17 minutes in. Lemieux had a comfortable lead over Leino in the first part of the final when the weather caused the race director to stop the race. 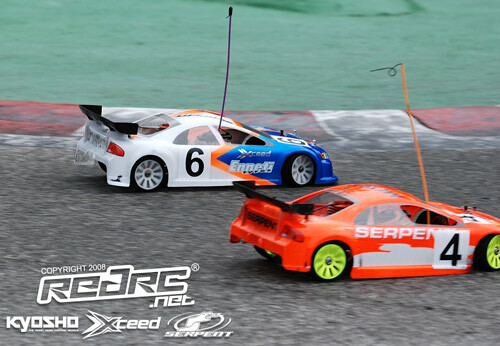 In the second part, run over the 13 remaining minutes of the half hour race distannce, Lemieux started from pole but quickly fell back down the order leaving Leino to cruise to the win of both the second part of the race and the overall ranking. Swede Strom, who put pressure on Leino for the second win, eventually claimed second and the runners up spot in the combined result while Lemieux’s win in the first part plus his fifth in Part 2 was enough to secure 3rd overall. Martin Hudy was having a great drive but was hit with radio glitches in the dying part of the race which appear to have cost him a place in the final. 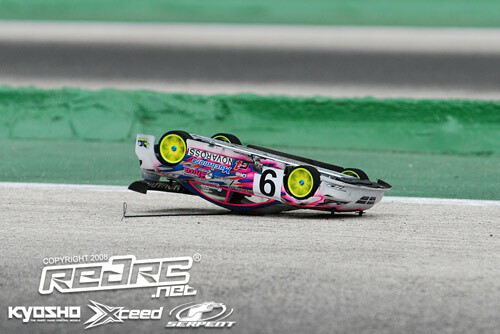 The Semi B brought to an end the great showing by 1:5 World Champion Martin Lissau who’s car suffered a wheel axle failure in the second half of the race causing him to miss the start. He got going again but pulled up with further problems after just 8 laps. 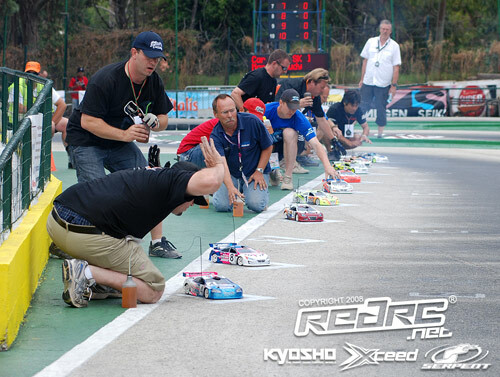 Also dropping out from the event in this race was Japan’s Takaaki Shimo who had battled for the TQ in early qualifying. The Semi B Final has been stopped due to rain. Young American star Paul Lemieux was holding a comfortable lead from fellow electric touring car ace Teemu Leino with 13 minutes to go when a shower caused the race to be stopped. The remaining part of the race will be run after a short delay with the two parts added together to decide the result. Due to the weather interruption it will now be the Top 3 from each Semi that progress to the Main Final. Update (15:21 GMT): It has started raining again, so the delay will continue until further notice. Looking at the skies here, it appears that it will be some time before the rain clears. We will keep you posted. Update (15:37 GMT): Race Director Frank Noens has just announced that a final decision on whether to continue racing today or move it to tomorrow’s scheduled spare day will be made a 16:00 GMT. Update (15:56 GMT): Racing is to resume in just under 5 minutes with the second part of the Semi Final B which is to run over 13 minutes. 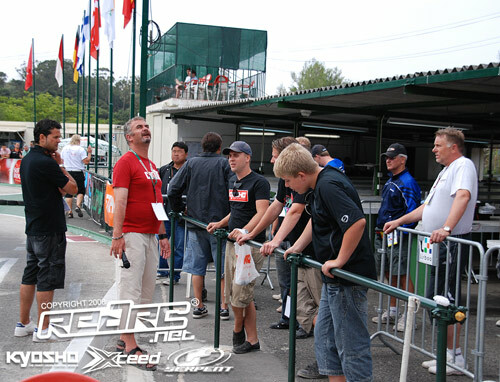 Drivers will line up in the order in which they finished Part 1 of the race so Paul Lemieux is on pole from Teemu Leino. Defending World Champion Keisuke Fukuda will take no further part in the 2008 World Championship after finishing outside the top 3 in the 1/4 Final B. With the Japanese driver not progressing to the next final it means, weather permitting, that this evening we will have a new World Champion. The 1/4 Final B was dominated by electric touring ace Teemu Leino who lead from start to finish under the guideance of double World Champion Adrien Bertin and his super fast pitman. Behind the Finn it was another Scandanavian who drove a faultless race as Sweden’s Roland Storm took second. The big battle of the race was for third between Hideo Kitazawa and local driver Filipe Costa. Entering for their final pit stop together it was Kitazawa who had the faster stop allowing him to get passed Costa to take the final bump position. After the race Costa, who was the top Portuguese qualifier, was clearly heart broken to have come so close to making the Semis. For the second time in a row Fukada missed the start after his Ninja engine cut but 8 minutes in his race was to come to an end after he was given a Stop & Go penalty for an incident with fellow countryman Kitazawa. Team-mate Rick V also saw his World’s come to an early end when his suffered terminal engine problems. Another big casualty of the 20 minute final was current Electric Touring European Champion Marc Rheinard, who looked to have pace for a Top 3 result, but the German rolled his Team Magic three minutes in having worked his way from ninth on the grid up to fourth. The 1/4 Final A saw a pretty frantic start to the race. Basile Concialdi took the early lead but rolled back to last on the third lap. With Spanish driver Oscar Cabezas taking up the lead, which he would hold till the end, the big battle behind was for second. In the very tightly packed group Mark Green was given a Stop & Go penalty for contact with Josue Artiles which dropped him to last. Although the British ace recovered to fourth its an early exit for the star of the 2006 Worlds in Brazil. Walter Salemi eventually took second followed closely by American ace Josh Cyrul ensuring that both go through to the Semis. Another big casualty of the quarter finals was local racer and Off road ace Miguel Matias, who was in a bump up position until problems meant he dropped down to 7th by the end of the race. The top 4 qualifiers are currently wrapping up their 1 hour long practice and following this we shall get straight into the Semi finals. The start of the final day of the 2008 IFMAR 1:10 200mm World Championships has been delayed for a second time as the rain has started to fail again. The warm-up had just started for the 1/4 Final B but the rain started to fall and the session was abandoned. Racing, which was due to get underway at 10:00, had already been delayed by 15 minutes due to early morning drizzle at a very overcast Monsanto track. Update (10:20 GMT) – After another attempt to get racing underway here in Lisbon the race director has again been forced to stop the warm-up as we experienced the heaviest rain fall of the morning so far. A 30 minute delay has been announced. Unfortunately the local weather for today is not looking good. Update (11:09 GMT) – Warm up for 1/4 Final B will begin at 11:15am local time. 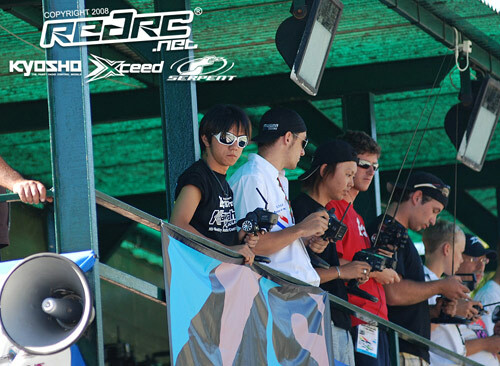 He’s the current World Champion and he’s been enduring a tough time in Portugal so far qualifying only 34th but Keisuke Fukuda has kept his title defence hopes alive by winning the 1/8 Final B which will see him progress to the final day of the 2008 competition. The Japanese ace looked as though his woes were to continue today as his car stalled during the count down to the start, the drama putting him last at the end of the opening lap. 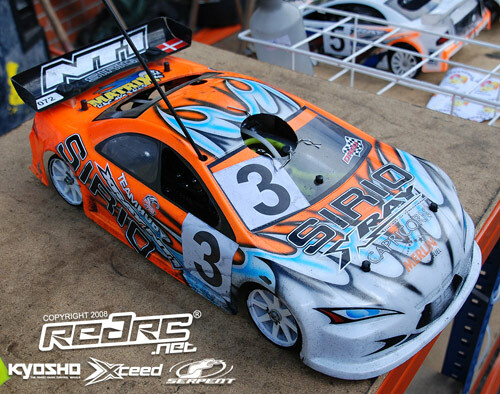 The Mugen/Ninja driver made a great recovery to get back up front but was chased down throughout the 20-minute final by nitro newcomer Marc Rheinard who also makes it through to Saturday having bumped up two finals today. Fukuda’s Mugen team-mate Rick V completed the top 3 to the relief and joy of his pit crew. The Dutch driver is very fast but was out of luck in the qualifiers. 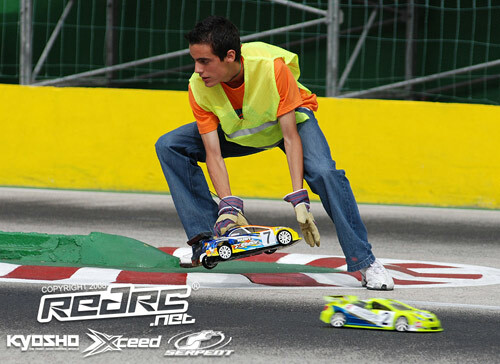 In the last race of the day, the 1/8 Final A, former 1:8 Buggy European Champion Miguel Matias took victory from Italy’s Niki Duina putting them both through to tomorrow morning’s 1/4 Final A. The battle for third was a rather heated affair between French driver Arnaud Chaussard and a slowing Brazilian Flavio Elias. The pair touched on the penultimate lap with Chaussard coming off the worst and once more on the final lap with Elias getting spun out. The Brazilian was called for a Stop & Go penalty for the first incident but continued racing and the Frenchman got the same penalty for the 2nd but had no opportunity to do his Stop & Go. With the race being over each driver had 10 seconds added to his finish times meaning the result didn’t change with Chaussard claiming the last bump up spot. 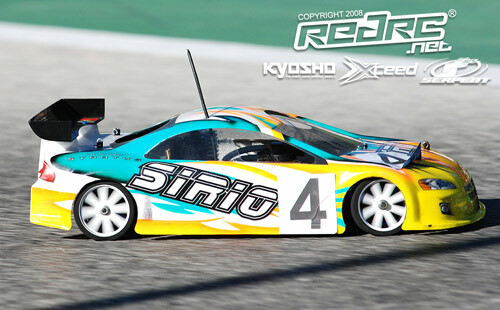 Big names to bow out of the 2008 World in the 1/8 finals include top French driver Jacky Mouton, Brazilian Eduardo Dulac, Manuel Huber of Austria and young English talent Kyle Branson. Just five races remain before we will know who is the 2008 IFMAR 1:10 200mm World Champion with the first of those finals getting underway at 10:00 local time. 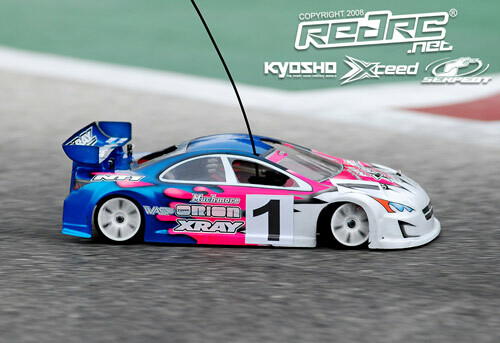 Thanks to our event sponsors Kyosho, Xceed and Serpent for enabling us to bring you our coverage from the Portugal throughout the week.